Lacombe is a city in Alberta, Canada. It is located north of Red Deer, the nearest major city, and south of Edmonton, the nearest metropolitan area. The city is set in the rolling parkland of central Alberta, between the Rocky Mountains foothills to the west, and the flatter Alberta prairie to the east. 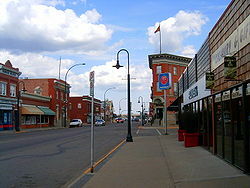 Lacombe became Alberta's 17th city on September 5, 2010. Lacombe is named after Albert Lacombe (28 February 1827 — 12 December 1916), a French-Canadian Roman Catholic Oblate missionary who lived among and evangelized the Cree and Blackfoot First Nations of western Canada. He is now remembered for having brokered a peace between the Cree and Blackfoot, negotiating construction of the Canadian Pacific Railway through Blackfoot territory, and securing a promise from the Blackfoot leader Crowfoot to refrain from joining the North-West Rebellion of 1885. The Lacombe Police Service have policed the community since 1900. In 1880 the first land surveys of the Lacombe area took place and three years later, in 1883, the first permanent settler arrived, Ed Barnett. Barnett was a retired member of the North-West Mounted Police (NWMP) who had served a mere three years. He left Fort MacLeod in August 1881 at 23 years of age. According to one account, in 1878, Barnett escorted Chief Sitting Bull and his people to the American border. Along the Calgary-Edmonton Trail, he established a "stopping house" for travelers on a land grant given to him for serving his service in the NWMP. His family and friends from Ontario moved out and the community began to grow. The Stopping House then became known as Barnett's siding. The Canadian Pacific Railway arrived in 1891. This provided better access to the area and new opportunities for settlement. By 1893 the downtown blocks and lots were surveyed. Village status was granted in 1896 and town status in 1902. In 1907, the federal government set up an experimental farm to research grain and livestock production. In 1939, the President of the C.P.R. William Van Horne renamed Barnett's Landing, Lacombe in honour of Father Lacombe. Nestled in one of Central Alberta's most fertile valleys between Calgary and Edmonton, the local economy includes a strong agricultural base supplemented by oil and gas industry. The city is also home to the Lacombe Research Centre where the first livestock breed developed in Canada, the Lacombe hog, was produced. The Lacombe Research Centre (LRC) is one of a network of 19 national agricultural research centres operated by Agriculture and Agri-Food Canada. The Centre conducts research in field crops and livestock production relevant to the central Alberta region. The Centre’s main research focuses on the factors that influence red meat: yield, quality, safety and preservation. The Centre also develops integrated, sustainable crop and animal production systems and crop varieties for the short-season environments of the parkland and northwestern Canada. The LRC developed a variety of hog called Lacombe. Work began in 1947. It took 12 years to develop the 'Lacombe' variety which is noted for its characteristics suitable to the harsh prairie environment. 'Lacombe' is 55% Danish Landrace, 22% Chester White, and 23% Berkshire. The 'Lacombe' hog was the first livestock breed to be developed in Canada. The Beaverlodge Research Farm and its sub-station Fort Vermilion are part of the Lacombe Research Centre and form the most northern agricultural research establishment in Canada. The Beaverlodge Research Farm specializes in research and development of technology for improved production systems for crops, honey bees and other pollinating insects adapted to environmental conditions in northwestern Canada. Research at the Fort Vermilion site focuses primarily on the adaptation of technologies for this northern agricultural area. The city's Seventh-day Adventist college, Canadian University College, was established near Lacombe in 1909 and continues to operate today. It and the nearby Hamlet of College Heights was annexed by Lacombe in 2000. Lacombe is home to many public schools within the Wolf Creek Public School Division, including École Secondaire Lacombe Composite High School – a Grade 10-12 school with approximately 800 students that recently underwent extensive renovations completed in 2009. Other public schools include École J.S. McCormick School (K-3), École Lacombe Upper Elementary School (4-6), Terrace Ridge School (K-7), École Lacombe Junior High School (7-9), and Lacombe Outreach School. The city's private schools include Lacombe Christian School (K-9), Central Alberta Christian High School (10-12), College Heights Christian School (K-9) and Parkview Adventist Academy (10-12). Several times, the main street of this community has been used in films, since it was remodelled to resemble a town in the early 1900s. Lacombe's Main Street is lined with restored Edwardian buildings in the downtown. Most prominent of these is the iconic Flatiron Building which today houses the Flatiron Museum and Interpretive Centre. The downtown area also has the oldest operating blacksmith shop, which is now the Lacombe Blacksmith Shop Museum and the Michener House Museum and Archives, which is the oldest remaining building in Lacombe as well as the birthplace of the Rt. Hon. Roland Michener, Canada's Governor General from 1967-1974. One of Lacombe's most famous residents was Roland Michener, Governor General of Canada from 1967 to 1974. A local museum and park, Michener House and Michener Park, commemorate his legacy as one of Canada's most famous and influential Governors General. Anna Maria Kaufmann, an international opera singer now living in Germany was raised in Lacombe. Irene Parlby helped to found the first women's local of the United Farmers of Alberta in 1913. In 1921, she was elected to the Alberta Legislature for the riding of Lacombe, holding the riding for 14 years. Appointed as minister without portfolio, she was the first woman Cabinet minister in Alberta. Parlby was one of the Famous Five who by means of a court battle known as the Persons Case established that women were "qualified Persons" in the meaning of the Constitution of Canada and therefore entitled to sit in the Senate of Canada. A lifelong advocate for rural Canadian women and children, Parlby was president of the United Farm Women of Alberta from 1916 to 1919. On behalf of the UFWA, she pushed to improve public health care services and establish municipal hospitals as well as mobile medical and dental clinics. In 1930, she represented Canada at the League of Nations. She is the first woman to receive an Honorary Doctorate of Laws from the University of Alberta. Lacombe is home to country music recording artist Gord Bamford. Are Your Interested in relocating to the Lacombe, Alberta area? Need More Information? Fill out the form below and a Royal LePage Network Corp. REALTOR® will get in touch with you to make sure you have all the information and help you need!